I haven’t read enough Clive Barker to decide if I’m a fan or not, but he certainly spins a fascinatingly lurid yarn. 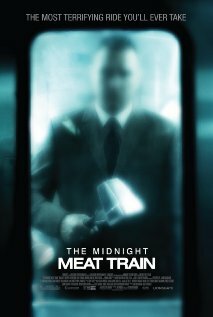 The Midnight Meat Train is based on one of his short stories, and it’s a bloody fun ride, even though I kept thinking I was watching a chopped up version that had scenes missing. There are moments when the action inexplicably jumps from Point A to Point M, and you wonder how the hell we got here. Anytime you pad out a short story into a feature length film, there’s going to be filler, and The Midnight Meat Train is no exception, but for the most part, director Ryuhel Kitamura and screenplay scribe Jeff Buhler keep it fast and gruesome. The ending is pure Whiskey Tango Foxtrot, but it’s not a cop-out. It’s surprisingly weird and horrible, and hints at a “bigger picture” that’s even more terrible than we had first supposed. And that, folks, is what good horror should do. What, no sequel?